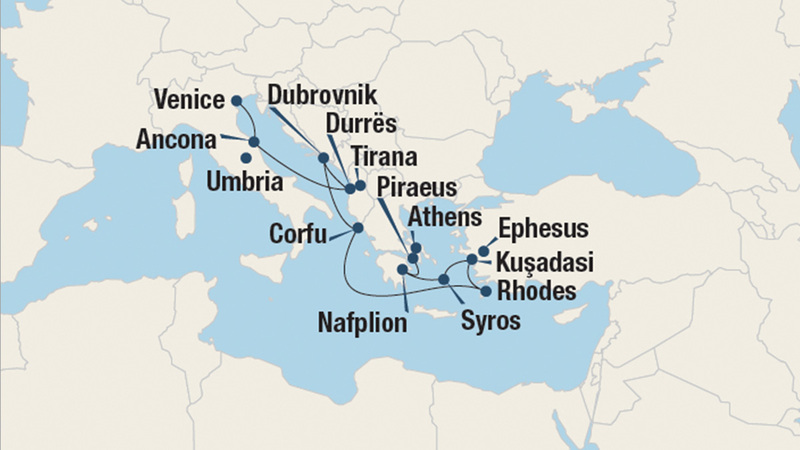 Sail to incredible destinations in the eastern Mediterranean aboard Oceania Cruises’ Sirena. Your journey begins in Venice, a city of timeless piazzas and charming shops. Sail to Ancona and explore the Cattedrale di San Ciriaco, its iconic eleventh-century cathedral. In Durrës, see relics of the past, including a second-century Roman amphitheater and columns of a Byzantine Forum. Next, travel to Dubrovnik, an ancient walled city on the Dalmatian Coast with a pedestrian-only Old Town. Journey to Corfu and relax along the coastline with its topaz waters and cypress-studded hillsides. A day's sail will take you to Rhodes where you can spend the day admiring an eclectic wealth of impressive architecture and historical sites. Then, in Kuşadasi, explore the Temple of Artemis, one of the remaining Seven Wonders of the Ancient World. Lounge on the beaches of Syros and visit its seaside cafés and shops. Before ending your voyage in Athens, stop in Nafplion and take in the view of the city from the Fortress of Palamidi or stroll through Syntagma Square.